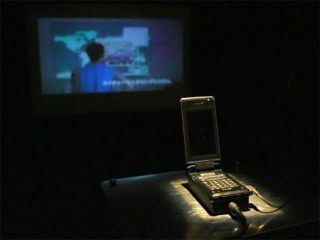 Projection and HD in a mobile phone! What will those phone companies come up with next, eh? As if actually calling people while not being tethered to the wall (the phone, not you) wasn't enough for some people, the mystical phone manufacturers of this world have only gone and stuffed a projector and HD images in a mobile handset. Well, it's only concept models at the moment, but KDDI and NTT DoCoMo have finally shrunk mobile projection technology down to the size of a huge battery, and Samsung has gone all OLED crazy again and put HD images on a mobile phone screen. The projection unit, shown at CEATEC 2008, is able to throw an image from the handset onto a wall at up to 50in screen size. It seems the contrast ratio is so poor that the handset only shows images well in the dark, so if you're a nocturnal businessman with a penchant for devices bigger than they were in the 80s, then start getting excited. Samsung's offering was a little bit more aesthetically pleasing, though not really any more useful. A mobile screen sized 240 x 800 with 16.7 million colours and a contrast ratio of 100,000:1 is certainly approaching HD quality in a mobile, and apparently it's going to get even higher in the near future, up to 1,000,000:1. Combined with amazing picture performance and quality, this certainly is a beautiful looking display... but surely more than would ever be needed in a mobile phone? Anyway, the prototypes emerging from this year's CEATEC are at least encouraging and interesting, if not ideal solutions in the short term.